Here in Wisconsin, we are fortunate to have a wide array of wild birds to watch year round. If you enjoy watching birds, setting up a few bird feeders is a great way to attract them to your yard, balcony, or patio. The right type of bird feeder to purchase depends on what type of birds you're hoping to attract and how much space you have at your disposal. Here is a list of the most common types of bird feeders available, what types of seed work best in each feeder, and some of the Wisconsin birds you can expect to see at your feeder. TUBE FEEDER- Tube bird feeders are excellent feeders for attracting smaller song birds. They are a cylindrical tubes with tiny openings for releasing small bird seed; the openings are generally small enough that large birds cannot fit their beaks in to extract the seed. Generally the perches are too small for larger birds, or the feeders may entirely lack purchases in the case of mesh feeders. 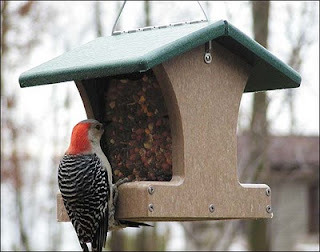 The feeders can be plastic, wire mesh, or sometimes just a hanging sack of cloth mesh. HOPPER FEEDER- A hopper bird feeder is more or less a reservoir that holds seed, and gravity causes the seed to disperse onto a flat tray (hopper.) This type of feeder is great for larger birds that cannot perch on tube style feeders, and a more versatile seed blend can be selected. Spillage from this feeder will attract other birds on the ground as well. SUET FEEDER- Suet bird feeders are generally hung to attract woodpeckers. Suet is a cake made of animal fat, and often has seed, fruit or insects blended into the cake. A suet feeder is usually just a wire cage which holds the suet cake and prevents hungry possums and raccoons from running away with it. Suet is very important to Wisconsin birds, as it provides them with the necessary fat content they require year-round. A suet feeder should be incorporated into any bird feeder setup when possible. HUMMINGBIRD FEEDER- Hummingbird feeders are different from every other type of bird feeder in that they dispense liquid, rather than solid seed. Hummingbirds drink nectar from flowers, so the feeder is filled with a sugary nectar substitute. 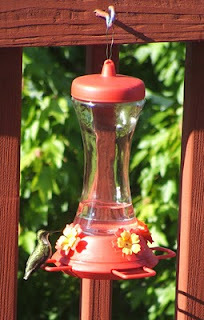 The feeder has a small opening for the hummingbird to insert his beak and drink of the nectar. This type of feeder can also be attractive to orioles. Hummingbirds only live in Wisconsin during the summer months, so this feeder should be put away when it begins to cool off outside. Four species of hummingbird have been documented in Wisconsin, although only two are common: the Rufous Hummingbird and the Ruby-throated Hummingbird. These hummingbirds winter in Central America. 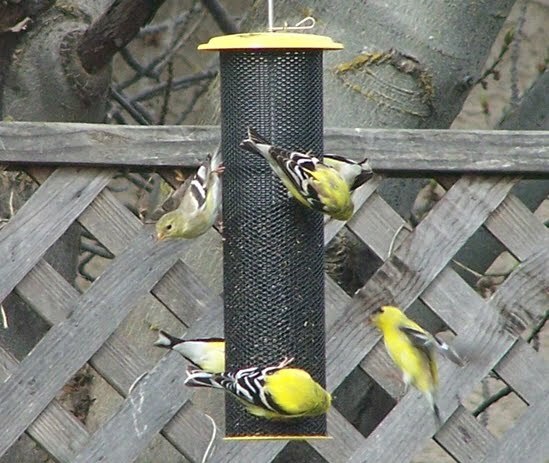 ORIOLE FEEDERS- Oriole feeders come in several different varieties. Some oriole feeders simply contain nectar syrup, much like a hummingbird feeder. They are larger to accomodate the larger size of the bird. Some feeders simply contain a spike on which to spear an orange, orioles favorite food. 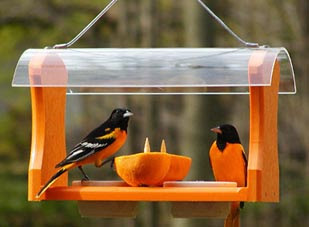 Many commercial oriole feeders will incorporate orange slices, jelly, and nectar into one feeder. Did you know that dental disease affects up to 80% of pets over the age of three? The first sign of dental disease in dogs is often bad breath. You might also notice lethargy, bleeding and swelling of the gums, and reluctance to play with chew toys. Dental disease might seem like a minor issue, but it can actually lead to far more severe health matters including problems with the heart, kidneys, and other organs. The infected parts of the mouth have bacteria that can spread to other parts of the body, often causing severe illness or infections. It's best to start a dental care regimen as soon as you get a new pet. 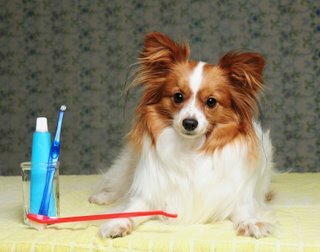 Your veterinarian can give you great tips on how to brush your pet's teeth, and your pet will become accustomed to it over time. If your pet's dental health has been neglected for some time, you can schedule a dental cleaning with your veterinarian where your pet will be put under anesthesia and receive a thorough dental cleaning and extraction of any infected teeth, if necessary. Your vet will also do a blood panel to see if the dental infection has spread into the bloodstream at all. Another great option for supplementing your pet's dental health is dental treats. A perfect example of a dental treat for your dog is a product I've recently discovered called Nylabone Nubz, Edible Dental Dog Chews. 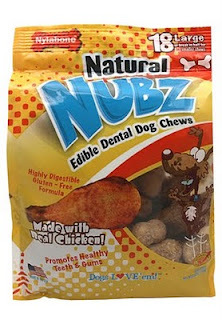 These dog chews are highly digestible, made of real chicken with no added sugar, salt, plastic, or preservatives, and they are also gluten-free (great for dogs with food allergies.) Nylabone has been creating quality bones and chews for dogs for over 50 years, crafted right in the United States. TIP: Nylabone products can be found at most popular retailers, but Costco members can enjoy a special discount! From August 19-September 12, 2010, Costco members can use a coupon in their monthly coupon book for $3.50 off Nylabone Nubz while supplies last.